Foot massage is necessary to pamper and care for your feet. Daily massage for few minutes keeps your feet strong and give you a relaxing feel, especially when you have spent most of your day time standing up and walking a lot. A gentle massage on the feet not only gives you relief from the pain but also improves blood circulation. In today’s time, foot massage is also considered as an alternative medicine to reduce stress and anxiety, recover injuries, relief from pain and improve your general health. Despite taking a foot massage therapy from any clinic and medical center, you can give a gentle massage to your feet, using innovatively designed and effective performing foot massagers. Here are some of the best foot massagers that you can easily use at home. This foot massager is one of the widely used and best-selling foot massagers. It provides a deep kneading shiatsu massage on your feet with the help of rotating rollers, which gives the relaxing and soothing feel. Comes with 6 rotational heads for greater massaging effect. It also comes with 18 massage node i.e. 3 nodes per head. It has a simple one-button operation for easy usage. Not suitable for those people, who have very high arches. Keep your feet relaxed and free from pain, by using this features-packed foot massager. It is very stylish in design and constructed with soft, luxurious faux leather. It has an adjustable position for massaging your thigh, knee, leg and foot. For leg massage, it has double action design for effective messaging. It’s gentle air pressure massaging functions both sides of your leg and target specially acupressure points to improve the blood circulation. For effective foot massage, it has rollers that work great when combined with gentle kneading pressure. For knee massage, it works on acupressure points from different angles. For thigh massage, you can make adjustments to the device from 0-90 degrees, depending upon the requirement. Pretty much expensive for most of the people. If you want a compactly designed foot massager with basic functions, this one is really good. This foot massager comes with a heating function for the quick and effective healing of the pain. Heated air massage when combined with Shiatsu therapy, works superbly well for people, who use to stand a lot whole day. Lightweight, sleek and portable in design for anywhere functioning. Effective in enhancing respiration and in proper blood circulation. It gives massage on both top and bottom of the foot. The usage instructions are highly misleading. This is one of the old-school foot massagers, usually found in doctor’s clinic. 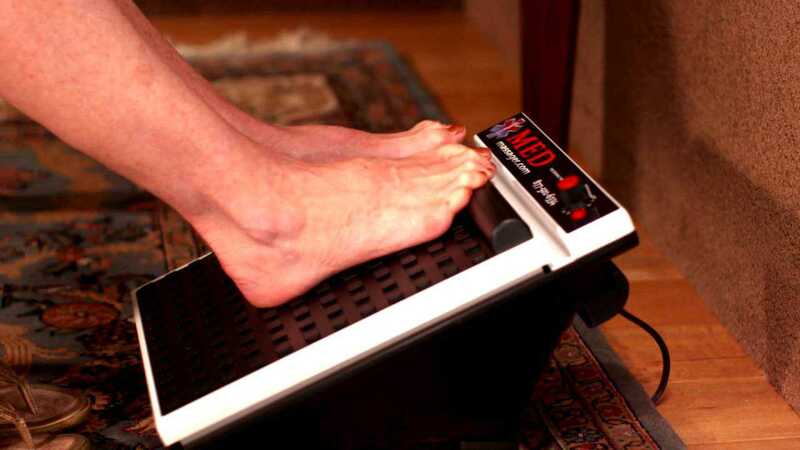 This foot massager is highly effective in its functioning. 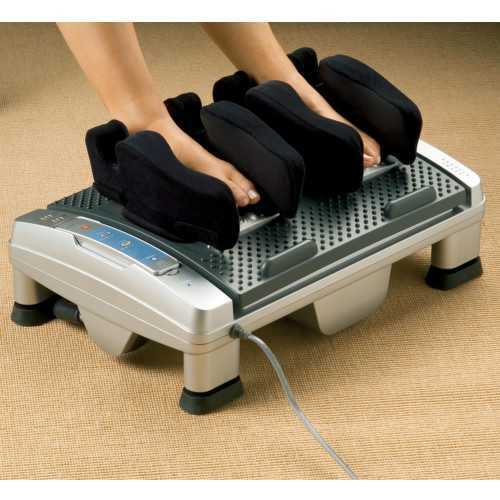 Its strong vibrations help in improving the blood circulation and relaxing your feet muscles. 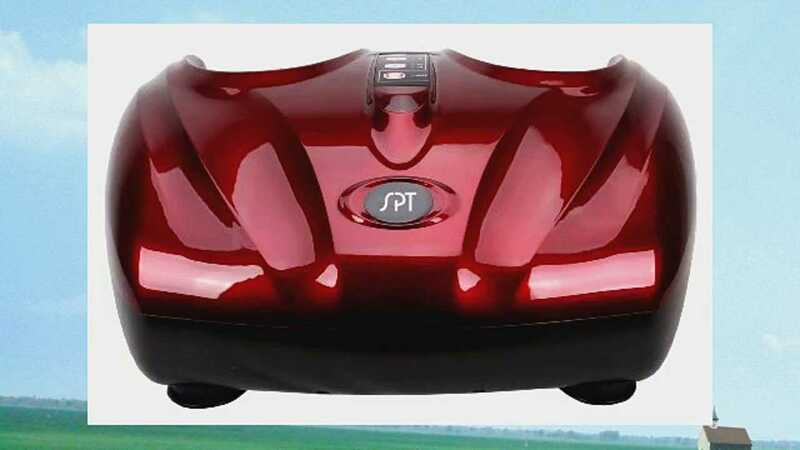 It is an electric foot massager with 11 speeds ranging from 1,000-3,700 rpm. 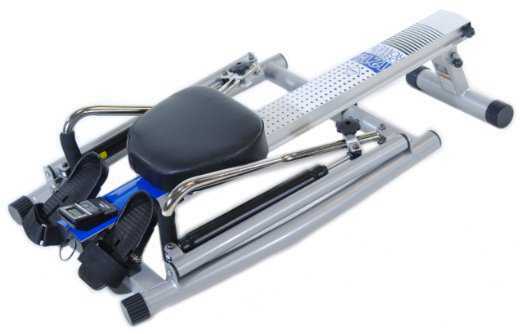 Comes with full-sized oscillating foot pad, along with arch-bar. It has reliable and sturdy construction and has a pressure point targeting surface. 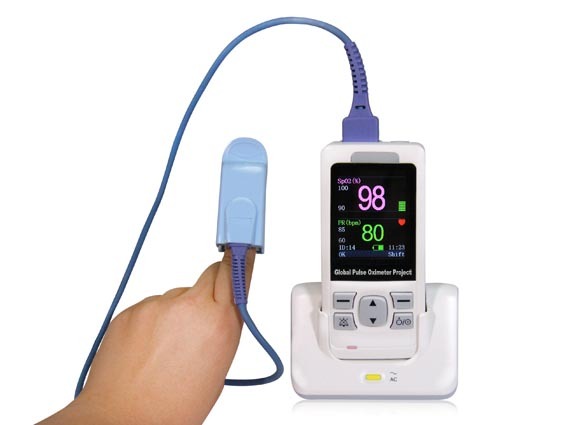 Extremely useful for patients with diabetes and neuropathy problems. As it is an electric massager, so cannot work without electricity. This foot massager will give you an enjoyable massaging experience with its power-packed features. You can use this foot massager to give relief to your feet, reduce stress and to augment the relaxation process in the body. Comes with adjustable air pressure for comfort usage. It uses air compression to improve the effectiveness of massages nodes and to boost up the blood circulation. It has two different massage programs and two levels of air compression, allowing you to customize it as per your requirement. Has 15 minutes of shutoff time along with overheating circuit breaker for secure functioning. Does not have remote control operation. Does not remember the last settings and gets back to the default one again. This small and smartly designed foot massager is fantastic in its functioning and is great value for money. By using this massager, you will feel relaxed and comfortable. Comes with deep kneading massage rollers and air compression for effective massaging. Works by providing heat for superb relaxation. Comes with 3 main auto massage programs, which include pulse, soothing and energizing functions. It has high and low-intensity massage modes. It works more like a toe massager, rather than foot massager. 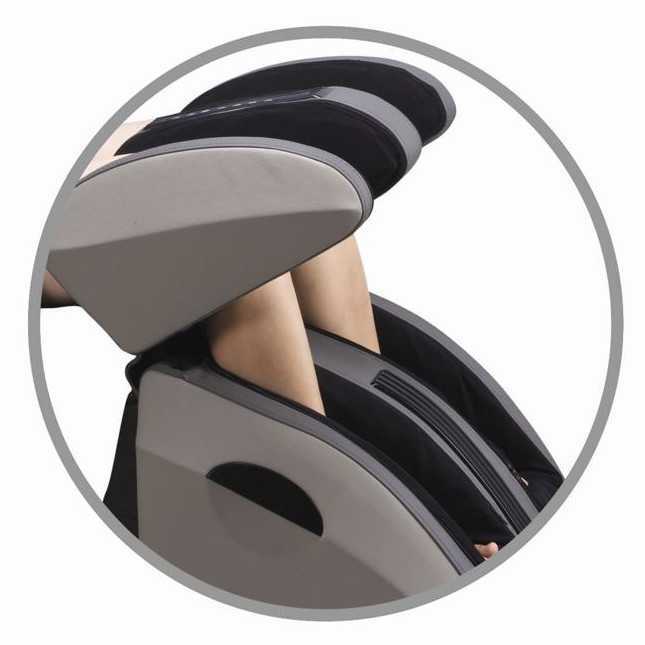 This ergonomically designed foot massager is stylish in design and powerful in performance. 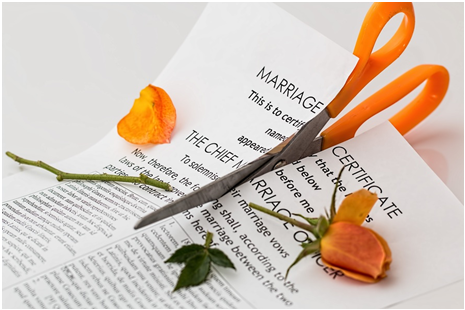 It can be used anywhere, anytime with great ease. It has vibrating plates, which vitalize and triggers all acupressure points around your feet altogether. Use this device to reduce stress level, improve your health, give relief to your foot and improve blood circulation. 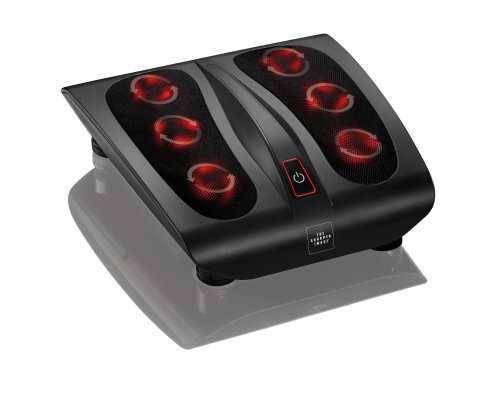 This foot massager offers kneading, percussion and infrared heat for better massaging. 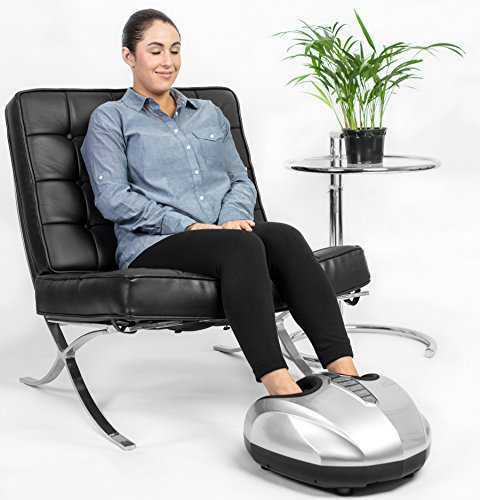 This foot massager is a safe and secure device to give relaxation to your feet. It is made-up of top-quality plastic material, which is temperature resistance and aging resistance. It is good for personal use. An all-in-one device, which gives infrared therapy, oxygen bubbles massage, heating therapy, and high-frequency vibration massage. Elegant in design and portable in nature. Help in improving blood circulation, relieving fatigue and enhancing metabolism. It comes with 3 pre-set programs: heat+bubble+vibration massage+infrared; vibration massage+bubble; and vibration massage+infrared. It uses US DuPont made PTC heating semiconductor, which heats up quickly, provides multi-insulation protection and helps in maintaining a constant temperature. It heats water to 50 degrees Celsius or 122 degrees Fahrenheit, which is not suitable for the skin of the children and elderly people. High-frequency vibration is very loud. 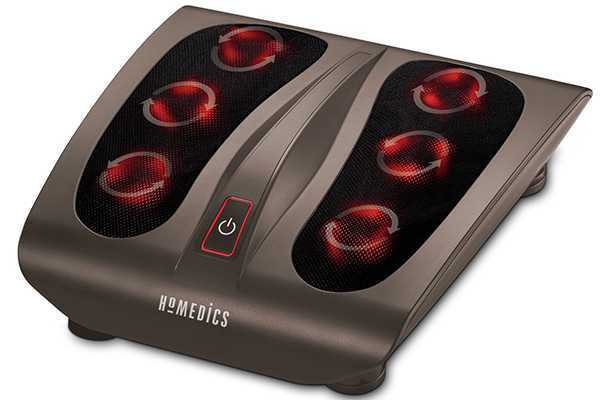 This is yet another superb offering from HoMedics. This elite foot massager uses Shiatsu technology to give relief to your foot from pain. It works on deep kneading action, which triggers your foot massage. It has toe-touch control for easy selection of the massage or heat and massage combination. It comes with LED illumination. Has 4 innovative counter-rotating massage heads. It does not have speed and heat control. This is one of the best massaging devices from the brand. It is powerful in performance with its impressive features. Made-up of plastic and portable in nature. Has toe touch control system for activating the heating and vibrating functions instantly. Has non-slip feet for improved stability. It does not have bubble action. If you want to give relief to your feet from severe pain and improves the blood circulation, these foot massagers are extremely good to use.